A few weeks ago I attended SLA Toronto's event Start It Up! The event was hosted by Helen Kula at the MaRS Discovery District where she works as a Senior Information Specialist in the Market Intelligence group. Four local vendors presented their technologies, all in the area of information aggregation. I was excited to attend because as someone who works and plays in the areas of social media, information management and knowledge management, I am always looking for useful new tools to use in my work. We live in exciting times when someone in his or her basement can quickly become the founder of the next Amazon, Twitter or Facebook. But it's not an easy road to getting there, and those startups that truly have valuable ideas need our support if they are going to be viable. The notes below are based on notes I sent out via Twitter during the event. No doubt there are inaccuracies and omissions as a result; I welcome corrections and additions. First up was Mark from Trendspottr. 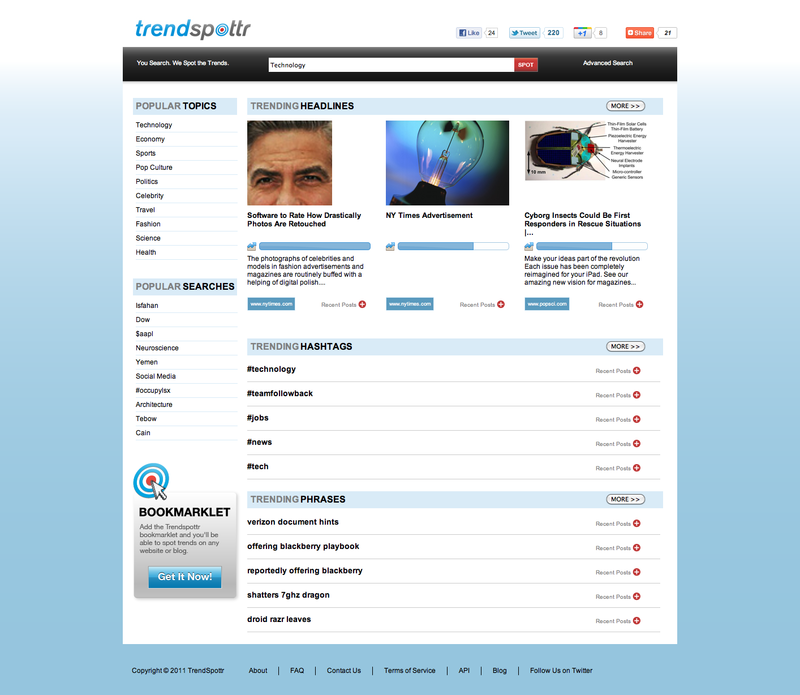 Trendspottr is a free web-based service that identifies and predicts trends from real-time data. Some of the largest media companies in the world are using it, for example: the BBC, The Guardian, BBC Today, Yahoo News and Canada's Post Media. Also some of the biggest PR agencies in the world are using it to identify trends. Klout is using also using it internally, sees the value of it. Mark explained to use that the "half-life" of content is now about 3 hours. It will soon be down to minutes. Value dissipates quickly. The focus of Trendspotter is to find data very early on, hours before general awareness. They are now trying to predict trends and outcomes, getting ahead of the info curve. Trendspotter has a bookmarklet that allows you to start a search to see what is trending on any topic. In December it will be integrated with social media "dashboard" tool Hootsuite. They will soon also be releasing Trendspottr Newsroom and Trendspottr Pro (with notifications and analysis). Trendspottr is also working on time-based influencer analysis. Next up was Nick Edouard of BuzzData, a tool for data sharing and collaboration. 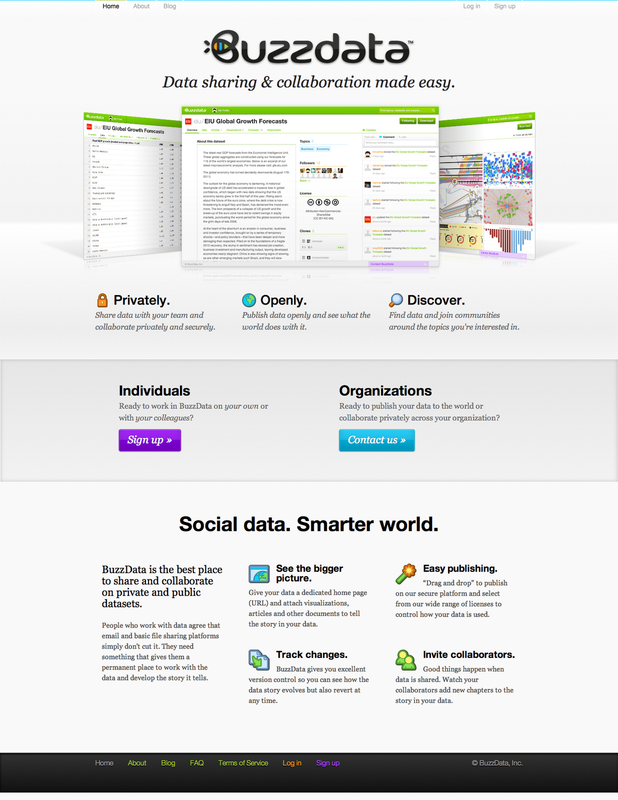 Data sets loaded onto BuzzData are given their own URL and tools for sharing or working with privately. You can choose your license for making data sets available publicly, for example making them available under Creative Commons. BuzzData helps to encourage community around the data, encouraging the community to work with, manipulate, and link to the data. You can add context to data including visuals, graphs, images. Versioning of data. Excel doesn't allow for this kind of data trail. Site has ability to flag content as being inappropriate. BuzzData is a platform. Edouard says "let's build an ecosystem of apps around it," which goes along with the general philosphy of BuzzData: "Good stuff happens when data is shared." It seems to me this is a lot of what we hear reporter/author Jeff Jarvis saying as well. Still in public beta, BuzzData is being used by newspapers, news agencies, governments, cities, not-for-profits, NGOs and more. Edouard explained that most people's experience with open data was version 1.0. We now need to take it a step further, curating the data and building engagement around it. How do you get experts to comment on something relevant and turn it into content for clients? That is the goal of ConnectedN. How does it work? ConnectedN delivers targeted information to the experts inside an organization (also for knowledge management and marketing teams). It allows them to easily add comments and then publish this out to blogs, a newsletter, Twitter, LinkedIn and other sources on the Internet. This allows you to easily designate one person inside your organization to spend an hour a week or five minutes a day participating in content creation. If you have a strong KM or marketing team trying to drive customer engagement, this makes it a lot easier. Currently ConnectedN is available as a paid, customized service, but will soon be launching a self-serve, lower price point service. Next up: Sam from Sciencescape with a new product launched that same day. Sciencescape maps out scientific publications/articles from PubMed, and includes news feeds, filters, timelines and article-level metrics. To date Sciencescape has been mapping out current publications. They will be relying on users to map out historic articles. According to Sam, Sciencescape gets better the more it is used: as comments are added in, researchers around "bleeding edge" areas can be identified. Once available to the public (soon! ), there will be flagging methods in Sciencescape to help police contributions. It is not yet ready, but in a few days we should be able to go to http://www.sciencescape.net/ and sign up for beta passwords. Next up at SLA Toronto start-up night: William Mougayar of Eqentia - a news/social media content curation platform. I was already familiar with Eqentia, having worked with Mougayar previously to put a sample site together (more on that below). 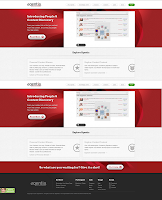 Eqentia allows organizations or internal departments to put content out to internal or external clients/customers. Content can be automated, curated, or manually gathered. 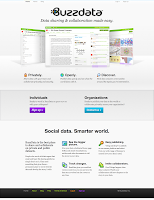 Eqentia looks for relevancy rather than popularity; it index 120,000 articles per day using semantic search. It looks for relevancy first, then popularity. It essentially allows you to become the publisher - content comes in, is filtered according to rules you set, and the good content comes out. 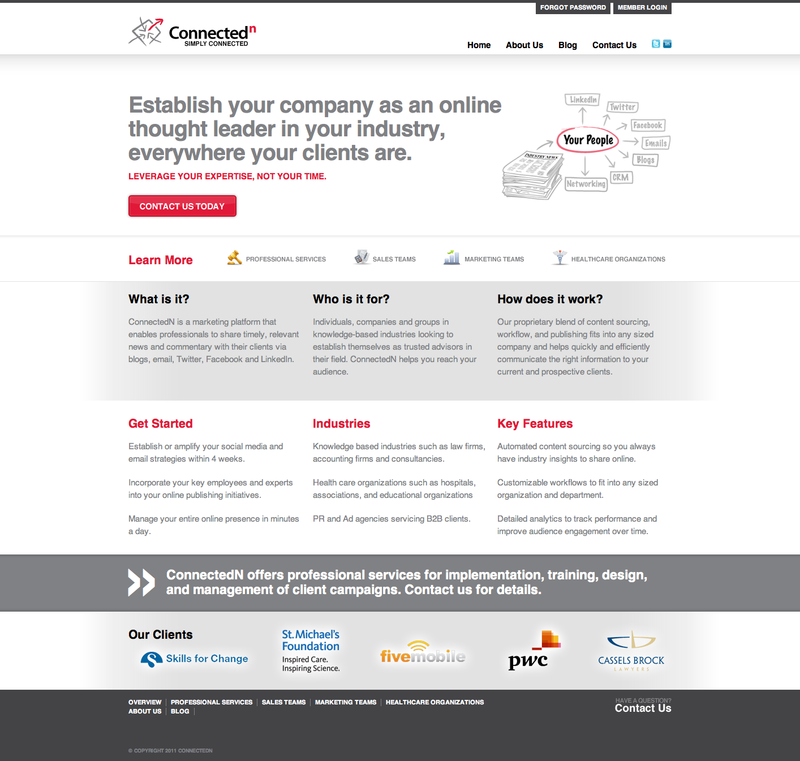 Your content can be branded, integrated with any site, even delivered via email. Eqentia acts as an all-in-one comprehensive platform allowing for content harvesting, filtering, aggregation, curation, branding, newsletter managemeent, semantic searching, publishing and more. The content integrates well with social media; it has "on ramps" and "off ramps" bringing content in, pushing content out. They already have a range of customers. Mougayar said he is talking to a few law firms currently because of mix of internal and external content. 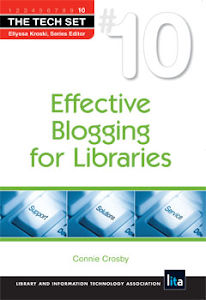 Mougayar showed a sample Eqentia site at http://www.librariesfuture.com/ that was created with my help. (It needs work and, yes, it is heavy with posts from my friend Stephen Abram). 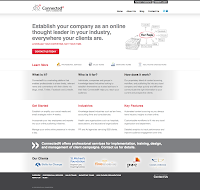 ITWorld Canada also has an Eqentia site http://www.itworldcanadacurated.com/. I personally find the subject of tech startups to be fascinating, and love to see us give support to these local companies, especially in terms of being beta testers, providing feedback, and giving them potential new business. During the Eqentia presentation, I was asked how I got involved with the project. Long story short: I had attended a few Toronto Semantic Web Meetup Group meetings organized by William Mougayar in an attempt to get my head around the semantic web. He is extremely humble, not talking about his own semantic tool at the meetings. As I started to get to know him, I started to ask about his company. Finally one day he invited me to see it in action. I was hooked! He then asked if I would like to curate a site. Of course! Unfortunately it has been a busy year and I haven't spent the time on it that I would like (which is why I've never written it up here previously). But I hope you will take a look. If you would like an introduction to the folks at Eqentia, let me know. I have no financial arrangements with them--I am just an enthusiastic fan-girl who likes to be the first to try things out. Everyone seemed to quite enjoy the tech start-up evening. I hope SLA Toronto makes this an annual event! Toronto is a real hot-bed for tech start-up companies, many of them working in areas that should be of interest to special librarians, information managers, and knowledge management directors. Great wrap up, Connie. I'm always digging around to see what new start up's are popping up and quick round up's like this are super helpful. Thank you for stopping by and for your kind words, Annie! Hi Connie. Great recap. It's been fascinating to see the info pros in Canada, the US and the UK leading the market by defining what they need to gather, filter and deliver the right information to the right people at the right time. Some of your info pro peers in Canada are finding the solution at Attensa aligned with their current and future goals in this regard. I thought I'd surface a link here for your consideration and for those in your readership. Happy Holidays and nice work.